FAIRBANKS — Researchers from Texas and California are getting ready to launch a NASA rocket to study the aurora. The 48-foot rocket will be launched from Poker Flat Research Range on a night when the aurora is visible. The rocket will fly 200 miles above Venetie, a village 140 miles north of Fairbanks, while cameras stationed there will film the aurora from beneath. The launch window began last Friday and extends through Feb. 6. The researchers are waiting for a clear, moonless night to launch the rocket. Learning about the energy between the sun and Earth that controls the aurora and influences Global Positioning Systems and satellites is the goal of Marilia Samara, the project’s lead scientist from the Southwest Research Institute in San Antonio, Texas. After the rocket is launched, UAF Geophysical Institute researchers will launch a smaller rocket that they built to test a launch rack they developed and test communication, compass and GPS systems. 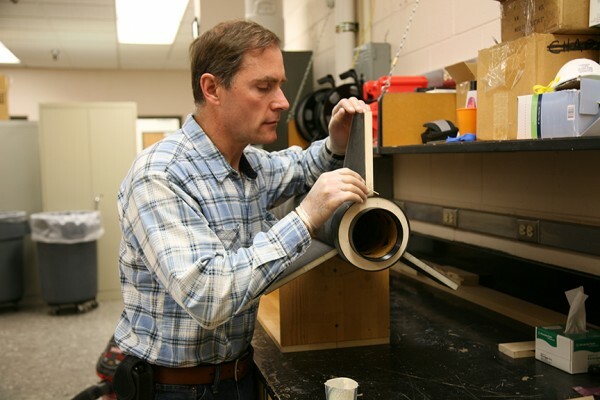 Jeff Rothman, manager of the Geophysical Institute Electronics Shop, as he works on the carbon-fiber rocket that will launch from Poker Flat Research Range in early 2014. The project is led by associate professor Mark Conde of the GI’s Space Physics Research Group. Today marks the opening of the 2014 launch season at Poker Flat Research Range north of Fairbanks. Scientists are preparing for an experiment that will launch a NASA sounding rocket over the aurora while observing beneath it using cameras based at a village in northern Alaska. The launch window for the experiment opens tonight and extends to Feb. 6, 2014. A second, smaller test launch will follow.